Hi everyone, wow July is here already! Happy Birthday to my mom!!! And it's time again for another Papertrey Senior Design Team challenge. This month, Nichole has challenged us to stamp on fabric. Have you seen all the fabric embellishments in the industry lately? There's tons of it out there, and I just love the home spun feel it gives to projects. It can all get a little pricey too....so you know me, I'm all about making my own embellishments. I thought this would be a great time to work on these 8" x 8" scrapbook albums for the girls again. I recently salvaged a bunch of the girls' old jeans from my garage sale and moved them into my sewing supplies. Denim makes for some great embellishments so I'd love to show you my ideas. First, I cut shapes from the denim using Cuttlebug dies. I also made some long strips using my pinking shears. I then used Claudine Hellmuth Studio paints(from Ellen's store) to stamp polka dots from Polka Dot Basics and images from Shapes by Design onto the denim. Simply use sponge brushes to slop up a little paint and then use it like an ink pad. I let the paint dry and then embellished all my denim die cuts with Vintage Buttons, ribbons, and Rustic Twine. Here's some of my stamped fabric embellishments in action on some 8" x 8" scrapbook pages. ...a stamped denim heart sporting green paint and a Lemon Tart Vintage Button tied with Rustic Twine. And strips of the stamped denim along the bottom of this page layout. I lined up a strip of denim along with a strip of New Leaf ribbon to create the perfect place for some journaling. More of the same here as I used another stamped strip of denim along with a denim flower that is embellished with a Vintage Button, Rustic Twine and some yellow flower ribbon. I love the horizontal layers below, using patterned papers and a stamped denim strip. Vintage Buttons tied with Rustic Twine finish off the look. Below I used the negative portion of the denim to create a fun flower embellishment. The open space creates the perfect little cranny for Vintage Button tied with Rustic Twine. Here's some denim tag shapes that have been stamped with the intertwining circles image from Shapes by Design. I added tied Vintage Buttons, sticky alphabet letters and ribbon through the tag holes. 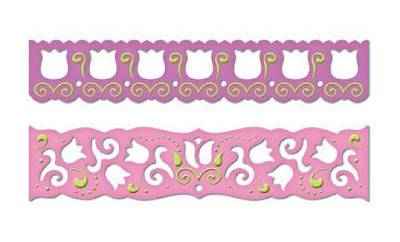 These go on the outside of the page protector...they look much prettier that way. I love this home spun look here, wouldn't this look fabulous on a gift bag or canning jar? I even used my leftover embellishments to decorate the scrapbook album covers. There were perfect little spaces for the denim accents...like this flower one below for Jordan's album. And this little heart accented with buttons for Josey's album. This was such a super fun challenge! I hope you try stamping on fabric sometime...it's fun to do something out of the ordinary once in a while. Try felt, canvas, tags for your quilting projects, gift tags, stamping on clothing, housewares like pillow cases, etc. The ideas are endless! Good day to you! 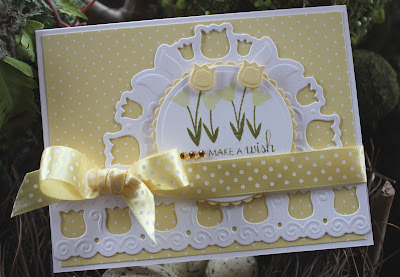 Today I have another fun card showcasing Papertrey's Vintage Picnic. Let me show you a few Copic tips first on selecting colors for your projects. I usually use patterned paper for my projects so I always start there for my color inspiration. I'll be coloring apples for my card today, so I chose this cute October Afternoon paper to coordinate. I started by choosing the green for my apples by laying the patterned paper next to my color chart (sorry, not available) that has the closest color of greens. I usually pick 2-3 shades that match...I chose YG93 and YG95. Then I moved on to the reds for the apples. I chose R24 and R29. I also used the same method to choose some tans for my basket...I chose E31 and E35. Then what I do is make a color palette to see what my colors look like on paper. Just as if I painting, I always test my colors on scrap paper first. I make a few scribbles of the color groupings just to make sure they blend well together, side by side. Then it's just a matter of filling in the colors on my stamped image. Today I used the plaid vintage picnic basket from Vintage Picnic, the cute apples and the *for my teacher* sentiment from Vintage Picnic Sentiments. I punched out my colored image with a scalloped square punch and then dolled it up using Borders and Corners Squares. For the background topper portion of my card, I used Background Basics: Text Style to add some text background, keeping with the teacher theme on the card. Pure Poppy ribbon, a tied Vintage Button and Ripe Avocado cardstock finish off the card. Have a great day everyone!! Go enjoy your summer!!!!!! What IS in Mish's Mason Jar???????? Isn't it fun to look forward to a Monday morning?? 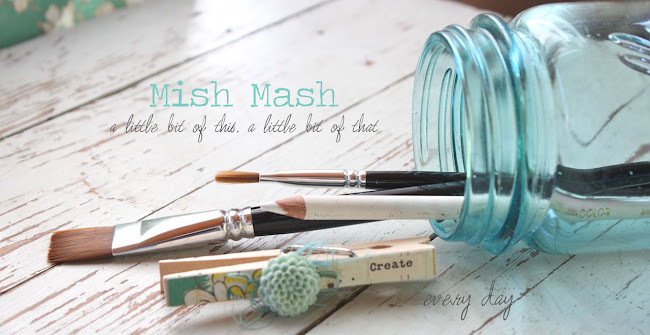 I've kept you waiting long enough so today is the day for my Mason jar reveal. It's been hotter than the dickens...what are dickens anyway?......and it really hasn't been good picnic weather here in Kansas. But it's cooling off a bit this week and I hope the humidity stays away for July 4th and Josey's birthday gatherings that we have planned. During these hot summer months in Kansas, sometimes you just don't feel like eating. Or so I've been told......I never feel like not eating, hence the pleasantly plump figure that I sport. But something light and cold is definitely better than anything hot. So please let me introduce you to my Picnic Corn Salad in a jar. Love your post as always. I'm going to say a salad will be going into those jars. Maybe you are putting a bunch of daisies in them, or lemonade or maybe even a layered salad. A fruit parfait, layered jello or ice cream sundaes. I love to make individual servings of sweet tea. The kids love to take out a jar to drink! If you recognize your post above, please email me at stamplady@satelephone.com with your full name and snail mail address. I'll send out your hand stamped Mishie goody package and hook you up with your $20 gift certificate to Eclectic Paperie, courtesy of Daisy and Joy from Eclectic Paperie! Another one of you were very close and guessed fruit salad....good try! And boy, did you guys give me some great ideas for what to do with canning jars. The comments on my original post made for a good read!! Thank you all for playing along, you really had your creative thinking caps on. So let's talk about my Picnic Corn Salad. I saw the idea in a magazine to put salad in a jar....but for the life of me can't find the magazine. So I had to get creative and come up with a recipe that would be perfect. I found just that recipe in a recent Weight Watcher's cook book magazine. I tweaked a few of the ingredients and came up with a delicious salad that is perfect for my canning jars. Here's the salad packed in the jars. The corn salad part with the dressing is in the bottom. The lettuce mix is packed on top. Circles of pinked gingham make a simple decoration for the jars. And these jars pack up great too. You can pack them in a cooler of ice and transport them easily, or stack them in the frig til you're ready to serve. At your picnic, you could have a tray of ice and nestle them inside to stay cool too. Here's the fun part. To serve the salad, you take of the lid and ring and invert the canning jar onto a serving plate. Jiggle out the ingredients until it's all dumped out onto the plate. The lettuce greens are on the bottom and the colorful corn salad with the dressing is on top. A meal in itself! And the flavors.....oh the flavor of this salad. A simple and light dressing over fresh veggies, nothing better on a hot summer day! I made up my salad for a *mock picnic* so that I could have photos for you guys. I had some extra salad and I really wanted my folks to try it. We love to share recipes and an actual taste test is even better, right? So I took my decorated jars of Picnic Corn Salad and packed a little lunch. I found this beat up, metal lunch box at a garage sale for $1 buck so I put it to good use. I'm going to digress a bit but here's a little story: My dad and I were looking at this old lunch box and he started reminiscing. He told me about how he and my Aunt Betty would ride this old horse to a little school house that used to be near where we live. My grandma would pack them a sandwich, an apple and some water into a lunch box just like the one I have. Then they would tie it to the horse's rope on their way to school. Boy, have we come a long way since then. And here's a funny: My dad said *If you really want to take a picture of something vintage, take your mother out to your picnic table and take her picture. * Ha ha, my dad is so onery. So I packed three pint sized jars into my lunch box that was lined with a patriotic cloth napkin. I stuck in some plastic forks (eek, I hate plastic utensils, shoulda sent some of my regular forks)....closed up the lid.....and sent along some extra dressing to drizzle on top. Here's my folks pictured below as they came to pick up their lunch. No, they didn't ride their horse......they rode in what I call their *buggy*, one of those Ranger buggy things. We love the Amish and their horse and buggies so I lovingly named their vehicle *the buggy*. They LOVED the salad and gave it two thumbs up! I also sent along a quart jar of my Easy Squeezy Cranberry Lime Cooler. They loved that too!! Sooooo, I hope it was all worth the wait. Let me know if you try the salad, it's reallllllly good!! Of course, I have to share a recipe card with you. This one will go front and center in my recipe binder! I used JustRite Stampers' new Preserves stamp set to embellish my recipe card. I think this jar image is just the most adorable thing, don't you? I colored it in with Copic Sketch markers to resemble my actual Picnic Corn Salad....coloring corn at the bottom and lettuce greens at the top of the jar. I used a Copic Multiliner to draw in some corn kernels. The label is paper pieced and I even made a little zig zaggy shape to resemble fabric sticking out from the jar lid. 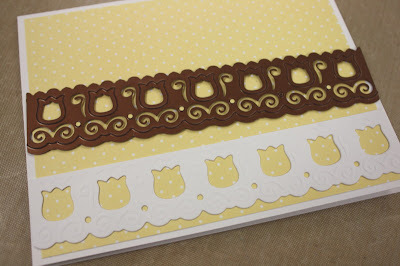 I then stamped the fun scallop border from the Preserves set onto Kraft cardstock. 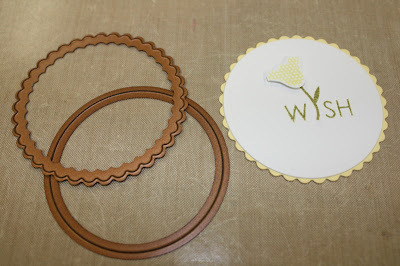 My circles were cut out with Spellbinder's die templates. The patterned papers for the front and back of my recipe card are from October Afternoon. I wanted to create a look that kind of resembled county fair colors and this paper was perfect! And here's the recipe for you to copy/print....maybe I should write a cookbook! Naaaa, I don't have too many original recipes, I'm just good at finding THE GOOD ones. ;) Enjoy it, everyone!! Combine first 4 ingredients in a large bowl; toss gently. Combine oil and next 3 ingredients, stirring with a whisk. Drizzle over corn mixture; stir gently. Add lettuce, toss gently to coat. This is a delicious portable side salad; mound lettuce on top of the dressed salad; then toss just before serving to keep the salad crisp. For salad in a jar, layer corn salad into pint jars, top with lettuce. Invert on plate to serve. I usually double the dressing to have extra to pour on top. Note: Fonts used for recipe card are listed on the left side bar, just scroll down a bit. Hello everyone, hope your weekend is going great!! I'm busy working on some projects for the blogaroonie and am enjoying this beautiful day in Kansas. 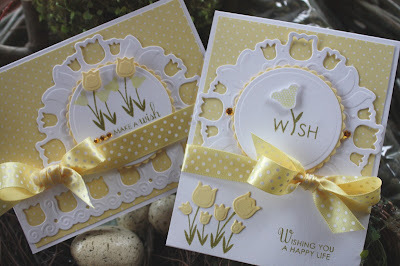 Here's a few more projects from the June Papertrey release: This is Josey's birthday card. She's a July 4th baby so I always make her a red, white and blue card. Be sure to head over to JustRite's blog tomorrow. Kellie will previewing some more new stamp releases coming out.......and more chances to win free goodies. 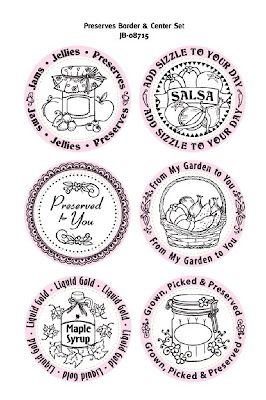 Click HERE to see more of the new Preserves stamp set samples. The Spellbinder's Blog Frenzy is in full force. 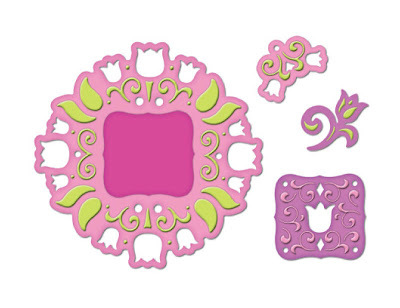 Be sure to follow all the blogs and enter each day for your chance to win free dies. Check out the Spellbinder's blog HERE to read more. 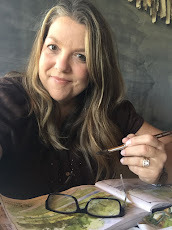 Check in tomorrow for my Mason jar reveal........then June 1st is the Papertrey Senior Design Team challenge......more fun stuff! See ya soon. I was looking at this Karen Lockhart image called Writing Letters, wondering what I could do with it today, Jordan came into my stamp room. We started talking about stationery sets and how when I was a kid, there wasn't all these fun scrapbooking tools and papers. So to have an actual stationery kit, a fun sticker pack and cool pens(remember the kind that had 4 colors to one pen and you clicked on which color you wanted? ).....well, it was pretty special. So I ended up with all kinds of ideas to create stationery sets for the girls' friends and for my friends too. I'll be working on that some day but today I created some cards that would totally be suitable for any age girlfriend. Who doesn't love to get a letter in the mail? I have to keep teaching my girls that letter writing is a good thing. They don't do it much I at least have them write thank you notes and send out birthday invitations. 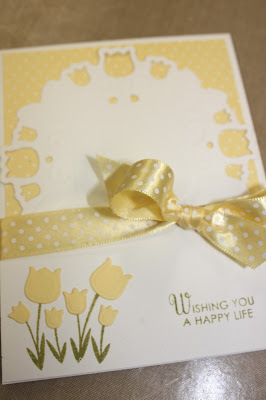 For my cards, I used some cute Doodlebug patterned paper for my color inspiration. I stamped the Writing Letters Lockhart image onto some plaid patterned paper and then paper pieced the envelopes/stationery portion using white cardstock colored with Copic markers. Tied Vintage Buttons and a Spellbinder's Scalloped Rectangle Nestabilities die cut finish off the focal images of the cards. Such sweet accents and pretty colors....pink Papertrey ribbons and sentiments from Vintage Picnic Sentiments finish off the cards. I have these cards sitting out because I think they're so cute. The memories that come back when I think how much I loved to write letters, have pen pals and get something new from the stationery section.......ahhhhhhh, heaven. This just in: JustRite Summer release #1 Sneak Peeks starts today. One set is being revealed today and the release continues on Monday. Each day you will also have a least one chance to win the set being revealed. Read on for more information. My family loves homemade salsa. With nearly all the fresh ingredients available right from our garden, there's nothing like it!! Every time I make a bowl, it disappears fast! I usually prefer for it to sit an hour our so in the refrigerator for the flavors to blend, but that usually doesn't happen. And I like to chop all my ingredients by hand.....no food choppers or food processors for me. Hand me my trusty knife and a cutting board and I'm good to go! It never really dawned on me as to what a great gift homemade salsa would make. Just pack your salsa into a canning jar, add some tortilla chips, and nestle into a pretty, napkin lined tray. And now I can add a nifty colored tag and ribbon! These are the salsa border and center images from the Preserves Borders & Centers Set. How fun is that image and the sentiment is very cute too! I stamped my images onto Kraft cardstock and colored them with my Copic Sketch markers. The bright colors just pop off the tag. I used a white gel pen to add highlights to the veggies and to color in the onions. LOVE!! My circle was cut with a Spellbinder's Circle die template. Ribbon is Papertrey Pure Poppy. Here's a view of how I tied the ribbon. Cut a long length and bring it up the sides of your jar and over the lid. Screw on the ring and then finish tying the bow. Very simple but fun presentation. And it wouldn't be complete without a recipe. I used the same image and coloring techniques but without the border sentiment for my 4" x 6" recipe card. 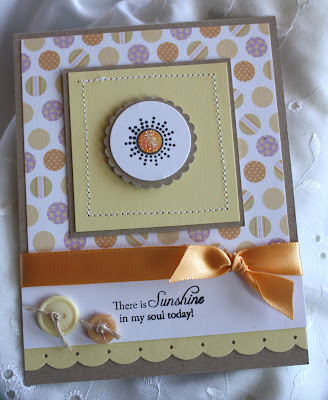 I cut the image out this time with a Spellbinder's Pinking Circles die template. Patterned paper is from October Afternoon along with PTI Kraft and Pure Poppy. For recipe fonts, please visit the sidebar on the left. Here's a closeup of that colored image. It's just perfect, I love it so much! Here's my Copic Sketch colors I used. PLEASE NOTE: The entries for my contest will be extended to 8:30 a.m. EST June 26 due to the difficulties I was having with the contest entry links. Thanks for your patience and sorry for any multiple emails. Answers to questions: All of the embossed areas you see on the die cut outs were made by the die templates, using the embossing method for the dies. I didn't use any other tools. And the size of the the Tulip Pendant die template is about 4-1/4" in diameter and the Tulips Borderabilities die template cuts a strip long enough to fit on a 5-1/2" wide card. Hope that helps! Are you ready for some fun? Spellbinders is introducing their new Shapeabilities Pendants and Borderabilities die templates during their Blog Frenzy from June 22 through June 29th. Products will be available for ordering June 30, 2009. Your comments on my post are always welcome but please note that this does not enter you into the contest. This contest is sponsored directly by Spellbinders Paper Arts. Please read the post to find directions for entering. If you have any questions, please e-mail PenContestQuestions@Spellbinders.us. And it wouldn't be complete without some fun projects to show you. For my first project, I started out by cutting and embossing the Spellbinder's Tulip Pendant die template using white cardstock. 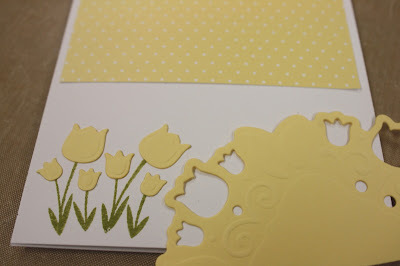 I then used yellow cardstock to cut and emboss small and large tulips that will fit perfectly onto stamped tulip stems. So that all of my pieces fit onto my card, I cut off a portion of my Tulip Pendant Die Cut. 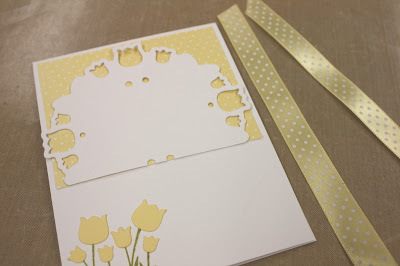 I then adhered patterned paper, my Tulip Pendant die cut, and polka dot ribbon to my card front. I also added a sentiment using green ink. To embellish the center of my Spellbinder's Tulip Pendant die cut, I stamped an image onto white cardstock. 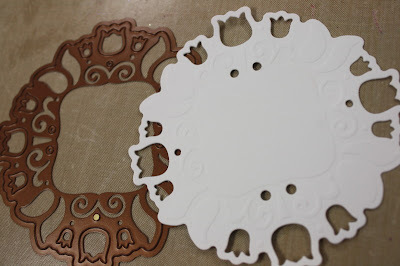 I then cut and embossed my image using Spellbinder's Large Circle and Scalloped Circle die templates. 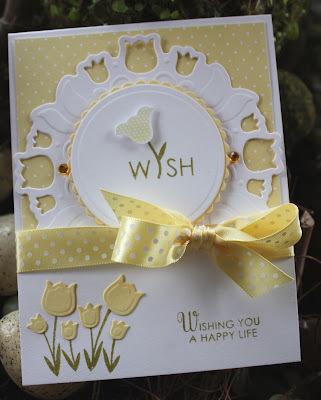 I then assembled all of my pieces to finish off my beautiful card and added two yellow sequins. For my second project, I created a card using the same supplies as above, plus the addition of the Spellbinder's Tulip Borderabilities die template. I adhered this beautifully embossed tulip border across the bottom of my card, added ribbon and some more tiny tulips to some stamped tulip stems to create another beautiful card. The texture, dimension and details that the Spellbinder's Pendant and Borderabilities die templates add is simply amazing. Be sure to zoom to see the details better. CONTEST INFORMATION: Welcome to the 3rd day of Spellbinders Pendants Blog Frenzy! Spellbinders is celebrating the introduction of Pendants die templates, a new die line that will inspire your creative mind. You have the opportunity to win the Pendant and Borderabilities die templates I’m introducing today by entering the contest at the end of this post. Be sure to read all the rules before entering! You still have until June 24th, 11:59 pm EST to enter at Debbie Olson's blog HERE. and until June 25TH, 11:59 pm EST to enter mine. Entrants visiting all 8 Spellbinders Pendant Reveals and correctly entering their information into the separate drawings, as described below, will automatically be entered into a GRAND PRIZE give away of a full set of the 8 Pendants die templates and 8 matching Petite Borderabilities die templates being revealed. *If you wish to be included in further communications from Spellbinders, please go to their homepage HERE and sign up for their newsletter. The most refreshing drink ever!